As an ecommerce pro, you should be. It’s a significant part of the biggest sales season in the calendar year. This period, which the National Retail Federation (NRF) calls the Winter Holidays, runs from November 1st through December 31st, and accounts for 30% of annual retail sales in the US. It’s a stretch that’s peppered with religious holidays, novelty days, and several of the biggest sales events of the year, including Black Friday weekend and Christmas shopping. 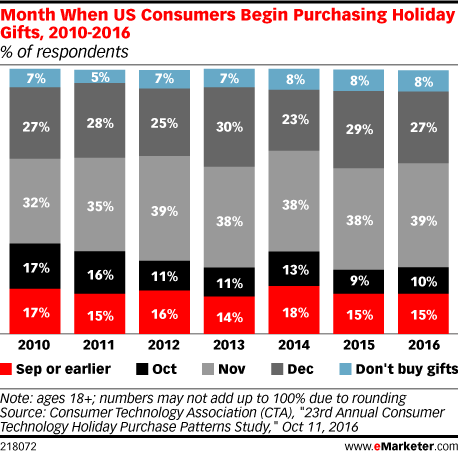 While some shoppers get a head start on the season and begin their buying in October, the most intense period comes in November and the first two weeks of December. 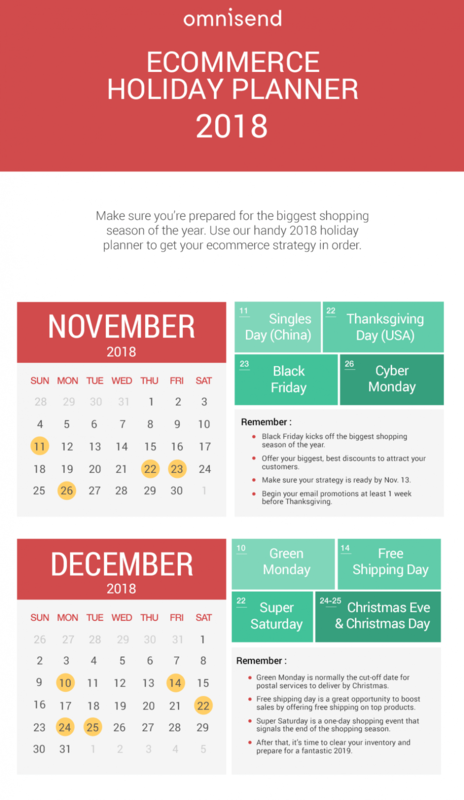 The average shopper plans to spend $794 on Christmas gifts in 2018 – a significant layout that will probably be spent in the weeks between Black Friday and Christmas. With a large average customer spend, year-on-year growth up to 4.8%, and in-built scarcity, retailers like you should be licking their lips. The holiday season is incredibly intense for both sellers and buyers. In order to get to your target customer, you’ve got to outcompete the other brands vying for your audience’s attention. It’s not just direct competitors, either – you need to outdo all the retailers coming for your shoppers. At a time when email inboxes and social media feeds are bombarded with all kinds of offers, you need to make your brand stand out. Now that we’re in December, you’ve got to adjust to the season and create Christmas campaigns. They’re a little more subtle than Black Friday promotions, but just as important. When marketers talk about engagement, it’s often granular and stat-heavy. You’ll hear about conversion rates, audience reach, conversions, and other technical terms. But your relationship with your audience is much more than your metrics. If you want to create a genuine connection with your fans, you should be engaging with them often and memorably. One way to do that is to connect your sales campaigns. Of the people you reached during your Black Friday promotions, some bought and others didn’t. Existing customers are 67% more likely to purchase from you than a first-time shopper. The more times someone buys from you, the more likely they are to buy again. Repeat customers will refer your brand to more people than first-time buyers. Assuming you’ve run a healthy Black Friday campaign, you should have some happy customers. The best time to re-engage them is….right now! Don’t let the good experience you’ve delivered in November fade. Instead, reward them with a follow-up deal for Christmas. If you make it something exclusive that only Black Friday buyers can access, you’ll surprise them with more value at a time they probably want it more than ever. If you do it right, the follow-up offer will feel like a bonus on top of an already great deal. You’ll create loyal customers that really connect with your brand. Here’s the best ways to implement this through your social media channels. We’d recommend doing this through your Facebook pixel and the custom audience option within Facebook ads. You should be able to easily set up a retargeting audience based on those who have interacted with you, bought from you, or even upload a .CSV list to build out the audience profile. We’ve got a great guide on setting this up for yourself right here. You can’t just run the generic campaigns you’re using year round. You not only want to make them Xmas focused (as explained in this piece), but you also want to reference that this is an exclusive offer for Black Friday customers. Really hammer home that exclusivity element. With the audience outlined and the creatives complete, you’ll be ready to activate your campaigns. But before you do, make sure there’s some form of social checkout attached to the campaigns. You want to make the checkout process as simple as possible, and adding a relevant checkout is going to massively help with that. Read more on setting that up right here. For the portion of your audience who didn’t buy, but demonstrated some interest in your Black Friday campaign, this is your second chance to convert them into buyers. They may have opted-in to your email list or engaged with one of your social media product posts, but something kept them from purchasing the promoted product. You can test different offers, products, and content during your Christmas sales campaign – but a far more effective way is to reach out directly to the people who didn’t buy. There’s nothing stopping you from looking up users who’ve liked or commented on your Black Friday product posts and speaking to them one-on-one. If you’re thinking a little bigger, you could send them to a brief survey page where you ask them a short series of questions about their decisions. You’d be surprised how quickly patterns come up. Instead of endless guesswork, let your customers tell you exactly what you got right and what you didn’t. Noah Kagan of OKDork used this strategy to transform a disappointing launch into a popular product. It’s also a chance to build relationships. The more you engage directly with your fans, the more opportunity you have to show acknowledge their support and show them love. Some brands seem to use their social media channels as a place to throw up some content and then disappear. They’re missing the point, in a big way! Social commerce is all about a two-way channel between brand and buyers – so use it! Find out what’s working as well as what’s not. Talk to customers and non-buyers. Ask questions, show them that their input counts, and that you’re invested in the relationship. Christmas is an especially great time to use this outreach strategy. You’ve recently run another campaign (Black Friday), you’re still fresh in their minds, and you can reward their input with immediate value – Christmas deals! The window between Thanksgiving and Christmas is a lot tighter than many people realize. Sure, the average person will see about a month separating the third Thursday of November and December 25th. But as a retailer, you’ve got even less time than that. By the time Black Friday weekend is over, you’re already in the last few days of November. Since your audience is probably a little fatigued by all the promotions they’ve faced on email and social platforms, it’s probably best to hold off a few days (at least) before launching another campaign. As an ecommerce retailer, you also need to account for shipping times and an overloaded postal system. You need to create a clear sales cut off date that will guarantee delivery by Christmas. Depending on where you are in the world, that can range from December 10th to 20th at the latest. All in all, you’ve only got about 2 to 3 weeks to run your core campaign for Christmas. Not much time, is it? How can you make the transition between Black Friday and Christmas? One way is to shift from a general sale during Black Friday to a series of specific deals during the Christmas season. Many brands connect their sales series to a familiar Christmas carol – The 12 Days of Christmas. Amazon, for example, is calling its 2018 Christmas sales campaign the 12 Days of Deals. The key is to make your Christmas social commerce campaign feel different from your Black Friday sales. Instead of slamming your audience with back-to-back general doorbuster sales, offer a rotating selection of products and different types of discounts during December. Social media platforms like Facebook and Instagram are perfect for product-a-day sales. You can keep things fun and non-intrusive, while still using scarcity to encourage buying. By asking your audience if they’d like to sign up for notifications about short-term deals, just like Amazon’s 12 Days of Deals, you’ll be able to target an extra-warm segment of your fans. If you combine smart product choices with a very active, helpful social media presence during your sales, you’ll create a great experience for your customers. They’ll get all the excitement and value from a doorbuster sale without having to physically fight off a mob of other buyers. Black Friday campaigns are rarely “seasonal” in appearance or feel. They’re just big sales that happen to fall a day after Thanksgiving. Thanksgiving is a quiet holiday weekend for most people, celebrated at home over a big meal. There’s not much that’s done in public – no special decorations on the street or in storefronts, and nobody dresses up for it. Christmas, on the other hand, is on the opposite end of the spectrum. It’s a very visual holiday, and everything from storefronts to people’s front yards are often plastered in lights and other displays. It’s important to match your brand’s online presence to what people are experiencing and what they expect during particular times of the year. For Black Friday, there’s not much you need to do from a visual perspective. Run a sale and you’re already matching expectations. Christmas, though, should to be treated differently. One of the best ways to engage with your audience in a unique and visual way is, of course, video! Do you use video in your social content? If not, you should start. 52% of marketers consider video the content type with the highest ROI. It’s a great tool, giving your brand another angle to connect with buyers. If you really nail it, your video content may go viral and reach a significantly wider audience than you ever expected. Several brands are known for their Christmas videos. It’s no surprise these brands choose to create intensely emotional videos. They’re memorable, shareable, and highly relevant to the season. Iceland, a UK supermarket chain, created a controversial video about the use of palm oil in various household items. Even though the video was banned from TV, it went viral and reached millions of people. Sainsbury’s, another UK supermarket chain, created a popular ad in 2014 that also went viral on social media. The video depicted the familiar story about British and German soldiers taking a break from the fighting during World War I. On Christmas Eve, 1914, they came together for a meal and a football game – a brief moment of humanity. These videos are highly effective, especially during Christmas. There’s no call to action and no sales pitch – and yet they reach more people, in a more memorable way, than any of the more traditional promotional campaigns. You don’t need to create expensive films – Facebook Live can do the trick. Just make sure that you’re reaching out to your audience with a message that resonates, that’s genuine, and that relates to the traditional Christmas experience. While videos are a great way to entertain and engage with your audience, they’re still just a one-way channel where you’re talking and your audience is listening. One way you can change that into a two-way relationship is by creating social contests. Christmas is a great time to roll out a hashtag campaign, especially if it’s related to a cause that your audience relates to and can get behind. Macy’s, for example, has been running its #MacysBelieve campaign for over a decade. For every letter sent through the online portal or dropped off in the red “Santa Mail” boxes in Macy’s stores, Macy’s will donate $1 to the Make a Wish foundation. Macy’s also sweetens the deal by doubling its donation per letter on December 7th – also known as National Believe Day. As mentioned in the “timing is everything” tip, you can shake things up by creating one-day events connected to non-Christmas novelty days. Like the videos, you’ll notice that there’s no sales pitch here – just a great idea supporting a popular foundation. This is what makes social commerce unique. Instead of just focusing on conversion rates, you can use social campaigns to build bigger audiences and deeper relationships. More (and better) engagement leads to a wider reach, as your fans share your brand’s content with their friends. Create a social commerce campaign that complements your audience’s Christmas experience and you’ll build a powerful platform for more fans, more loyalty, and future sales. Which products should you build your Christmas campaign around? For brands with seasonal products, it’s usually obvious. If you sell outdoor apparel, promote your winter gear – not your swimsuits! For other brands, though, it might not be as clear-cut. There’s one sales strategy that’s perfect for Christmas and built for social platform – gift guides. The idea’s simple – feature a collection of products that go well together and are aimed at a specific type of buyer. It could be a collection only featuring your products, or a guide showcasing one of your products with other brands’ items. For something more geared towards social commerce, though, head over to Instagram and search for #giftguide – you’ll find over 400,000 examples of visual collections. Gift guides are both inspirational for shoppers looking for gift ideas and highly shareable pieces of content. In order to navigate the holiday sales season, you need to create a campaign that prioritizes efficiency and ease of use. Your customers are being bombarded by dozens of deals every day, from a multitude of brands, all over their web experience. If you present your audience with a lengthy or complicated promotion, you’ll lose them. The run up to Christmas is the perfect time to make use of jumper, the chatbot that’s specifically designed for social commerce sales. jumper seamlessly ties into your brand’s social profiles and allows you to engage with interested customers and immediately walk them through a sale. Along the way, it will automatically collect buyers’ contact info and build your list. As more and more online shopping takes place from mobile devices, you’ve got to create experiences for your customers that both look good and function smoothly. One of the most important things you can do during any sales campaign is build email and Messenger lists. This allows you to get creative in future marketing efforts and follow up with interested members of your audience. Campaign-specific landing pages are also great opportunities to ask for more social engagement. Notice the links and calls to action at the top of the page? They’re there to encourage interested customers to opt in to a specific email list and engage with Amazon on social media platforms. Landing pages like this are a great tool in your social commerce arsenal. You can use them to get ahead of the seasonal marketing crush by directing your audiences to a simple opt-in page. When the sale starts, they’ll be notified and your funnel will kick off. It’s a great way to build value into your social media posts. Remember, a significant portion of your audience is always on the lookout for deals, and they start holiday shopping by October. Why no let them know what’s on the horizon? It’s vital that you build carefully curated lists that reflect your audience’s interest. These are the building blocks of future campaigns, whether they’re direct follow-ups or completely new. ‘Tis the season – right now! If you’re hesitating with your holiday season social commerce campaign, don’t! As we’ve covered, you only have a small window in which to reach your customers in time for Christmas shopping. You’ve got to create a creative social commerce campaign that fits the season and plays to your audience’s needs and expectations. The best way to serve your fans is to smoothly transition from the intensity of Black Friday into a more subtle series of promotions for Christmas. jumper can handle your campaign’s management and sales. All you need to do is structure your deals, maintain clean customer lists, and create Christmas-relevant content that really connects with your buyers. Do that, and you’ll create a merry Christmas for both you and your customers!